I’d like to offer a first evaluation of my time commuting on running shoes. I was not properly organized, which meant I had to start with what I had “in stock” around my house. 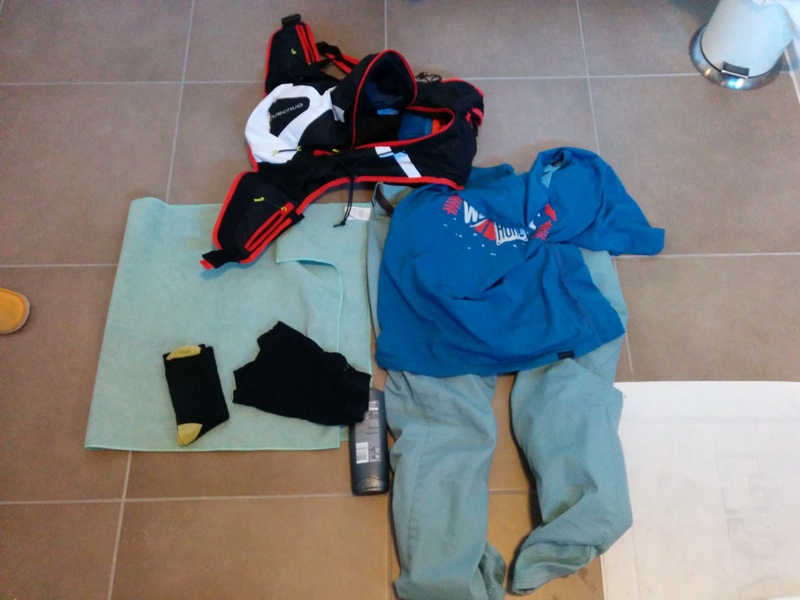 So I took my 20l hiking backpack and packed it with all my clothes, towel, soap, shoes, lunchbox, …. Put on my running clothes and shoes and off I went. 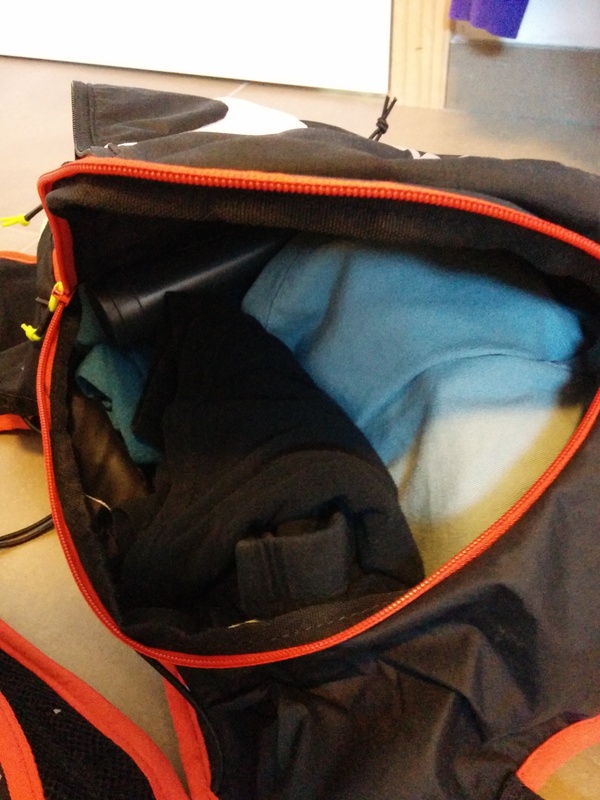 Second impression “This backpack is not OK for running to my work”. Second day I tried pushing everything in my trail backpack that holds my camelbak. Waaay to small. 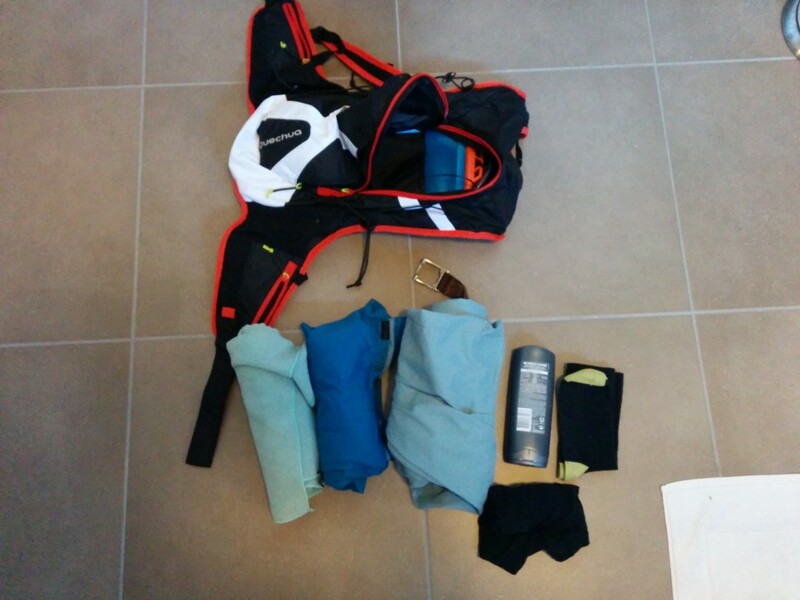 I bought a new backpack at Decathlon that was suited for long trailruns. I think I’ll write-up a review some day for it, because it suits me pretty well for my needs. The biggest plus about it, is that the band around the waist is with velcro. Why didn’t anyone think about this earlier! Along with the new backpack I decided to leave an extra pair of shoes and one of my older jackets at work. I do not need these during my run and as I have a desk job, it’s ok it’s one of my older, more worn, jackets. This way I could free up some space and my was my backpack more than big enough for my needs. All of my stuff I need layed out. I also have a small towel with fast drying microfiber which is just big enough for a quick shower at work. Then it’s just rolling everything neatly in a roll and start filling the backpack. 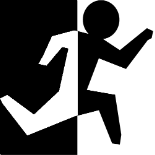 My running form seems sloppier with a heavy backpack. It’s not rare I end up with stiffness in my lower back. That’s something new for me that I can work on. I had a sense of new found freedom and upped my weekly mileage too much in the first week. I needed to restrain myself or I knew it would be too much for my body. Sense of freedom. You step out of the office and have an instant feeling of being liberated. Easy way to get your weekly mileage up. If you have any questions whatsoever I’ll be more than happy to answer them. Great post. I have a couple of questions. I’m considering doing my first ultra soon- a 50K. Could you recommend a backpack for me? Also, I too have noticed lower back pain since completing the Paris Marathon. Any tips on how to sort this out? It’s hard to tell you whick backpack, because a fitting is essential. What I can tell is that it’s important you can pull it tight around your waist (hipbones) and that it shouldn’t be sliding up after a simple 100m jog in the store. An included waterbag is a big plus, as you can drink handsfree this way. Concerning your lower back pain I recommend checking if your shoes aren’t worn out and evaluate if you have been resting enough after your marathon. How funny that we both wrote about this on the same day. I agree about the sloppy running form. I have to be careful about that. I’m lucky that I have a public transport option if I don’t want to run both ways, but I also like the way it churns through the miles quickly.